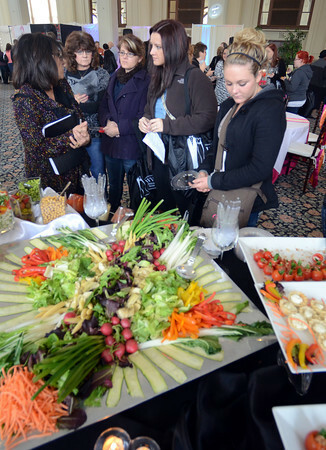 Catering to your needs: Cathy Azar of Azar’s Catering chats with bride-to-be Ayrica Lambermont at the 2014 Winter Bridal Showcase Saturday in O’Shaugnessy Hall at Saint. Mary-of-the-Woods. With Lambermont is her grandmother Peggy Johnson, mother Misty Lambermont and maid-of-honor Brooklyn Samm.